The Switch's flagship game, Legend of Zelda: Breath of the Wild, is one of those games that has held its value since it launched in March 2017. But now, finally, someone is actually offering a deal on the critically acclaimed title. 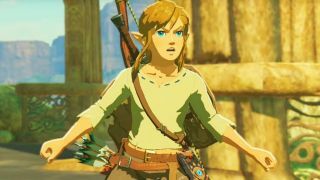 US retailer Walmart is selling Zelda: Breath of the Wild for just $45, that's down from its usual RRP of $59.99, which might be the best saving on the game, like, ever. Seriously. This is one of those rare Black Friday game deals that you won't see happening at any other time of the year. This game is still the best Nintendo Switch game of all time so the price has held since the Switch's original release. Getting any kind of money off at all is almost a rarity, so if you do want to pick this one up, then make sure you move fast on this one. Also, keep you eyes peeled on our Cyber Monday Nintendo deals for more hand-picked offers on consoles, games, accessories and more.